Digging out from SIGGRAPH and L.A.
– I’ll be at the Google Dance on Tuesday night. – I’ll be roaming the halls and attending sessions, especially on Tuesday and Wednesday. If you see me, please walk up and say hello! I’d love to hear your thoughts about things that Google should be doing. 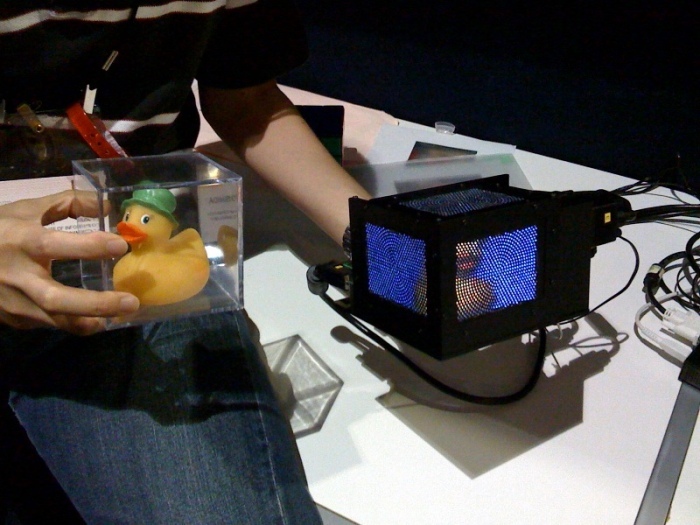 By the way, the LED cube in this image is this project. Would love to get some insight on the Google-Digg discussions that went down. Any hope of a second attempt at resolving the differences? What changes would have been made to their algos to make submissions more fair? Enjoying the Monday sessions now – the foreign search – Asia was interesting – comparing Baidu and Google and noting how Google’s technology is dramatically better while Baidu….has most of the market. After visiting China I’m wondering how much the cultural differences are reflected in search preferences. e.g. are Chinese more comfortable having ads planted at top of results, as Baidu do do. Yeah, I have been DIGGING like crazy and the results show. Would love to hear more about it. Got my Google shirts and hat too. Things are good! Feeling lucky. Joe Hunkins, did they mention the way that Baidu provides MP3s where (until recently) Google didn’t? Can you ask for the hover over “?” help in the new adsense for feeds to go away, they are serioulsy annoying and often stay open in a locked up state in IE (not sure about other Browsers) when burning feeds. The only way to ulock them is to Refresh or Save and re-enter the page. It is near impossible to NOT accidently hover over one when burning feeds. Over-all though, another winner from Google IMO. I so wanted to be at SES San Jose, but I couldn’t swing it, will try for the next one in Chicago or Texas, their program is so exciting! Could You help me Matt? I’ve just bogught this pedometer what You’ve got and when I download the data, the software add one extra zero to it. for example if my daily steps was 7567 on may computer shows 70567. Looking forward to the dance. Stuntdubl, Jon Kelly and Lauren raised some tens of thousands of dollars for some great charities, we had great food, and a great time. Haha! “Lord of the cuttlets” is the coolest title I’ve ever known! I like it! I love visiting LA. Such a cool place to hang for a few days. Hope you had fun! Great to see you today, you around Thursday also? Are you sick or something? Where are the new posts? Can’t you see them, they are at least 4. To be fair, Matt has been busy; traveling and participating in two conferences; SIGGRAPH and SES San Jose. Hey Matt, this year I took 6 employees along with me to the Google Dance. I have to say that you guys really know how to throw a party! It’s amazing how Google can be such a huge corporation and still be able to through a party that makes the guests feel like it’s all about them. I don’t know how Google could ever come up with a better theme than “glow in the dark” when entertaining geeks like me! Kudo’s to those who had the responsibility for planning and pulling off this party. Peter (IMC), I kinda got out of the blogging habit a little bit and now I need to remember how to get back into it. ← What to do in Los Angeles?